As deserving of its reputation as this company is, Knog is obviously not one to rest on its laurels, as several improvements are evident in the new range of Blinder Road lights. While its Blinder series may have initiated the trend to take the Knog range out of the blinkie “be seen” category, these latest Road lights put Knog into serious “get-out-of-my-way” bicycle lighting territory. As far as light output goes, the name Blinder said it then and still says it all today — in spades. 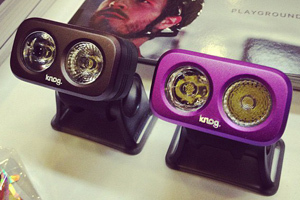 Knog claims up to 200 lumens on the front and 70 at rear, giving both a claimed visibility to 1000 metres. Of course while these sort of numbers are valuable to know when making shopping comparisons, it’s the light output that matters on a dark road. So while this reviewer can’t attest to the 1000 metres, these lights most definitely give outstanding visibility on busy night city traffic up to a distance of two bustling CBD blocks — a great result in standing out from the cycling and/or driving crowd (at least until everyone else gets a Blinder Road light set). However there is a good range of settings available as well to help differentiate you from the troops, and a good choice of modes to choose from on top of the choice of high or low beam plus wide or narrow beam. Offroad or on paths without lighting, the Blinder Road’s output I would say is comparable to those light sets that are available with separate battery packs that join to the shiny end with a cable – and these latter are of course much heavier. The rear light’s lenses have a 15 degree angle built in to make up for the angle of the saddle post mounting. The rear light can actually be a little too bright to ride behind, which must be why it comes with what Knog dub a “peleton” mode. This latest from the Knog stable is again USB chargeable (flip-out and incorporated into the “underside” of the main body), but also comes with an extension cord — which is very handy for the sometimes awkward USB port accessibility when trying to plug two lights into the one computer, as you will often find that USB ports are close together, and plugging both lights in will be impossible without the extension. Of course the lights are also rechargeable with any iPhone or iPod charger that uses an adapter to plug into a wall socket, and are actually quicker to charge that way. The on/off button seems more tactile, and comes with some slight feedback delay, which is a brilliant feature to help ensure you don’t turn the light on or off unintentionally (or your other belongings don’t end up switching it on by mistake so you find the light illuminating the bottom of your pannier at home time). Another helpful feature is that the Blinder Road allows you to choose a favourite light setting (high or low beam, flash or steady etc), which it remembers next time you switch it on. The low battery indicator is also a very handy feature. There is also inbuilt side illumination in the rear light, which is something that worried earlier users in poor visibility conditions — although to my mind this was a baseless concern as the light puts quite a visible “spotlight” on the rear wheel. Definitely waterproof (the front light was left under a sprinkler to test this), and therefore dust-proof, the Blinder Road should take whatever the weather can pelt at riders. Each has an anodised aluminium casing combined with industrial grade silicone, and an integrated silicone strap grips seatpost and handlebar firmly with a stainless steel clamp-on style clip which is still quick release. The silicone straps are suitable to a range of mounting diameters, but just in case the head light also comes with a larger strap piece. The lithium polymer (LiPo) batteries are circuit protected, and keep burning bright until the juice runs out (that is, no fade-out at the end of the charge life). The front light weighs 75gms and the rear 52gm. An obvious great choice for the coming dark winter, the Knog Blinder Road light set takes bicycle lighting solutions to the next level. Compact, light weight, waterproof, USB chargeable and in an integrated silicone and aluminium package — I really don’t know what else riders could ask for (and we’re a notoriously fussy lot).